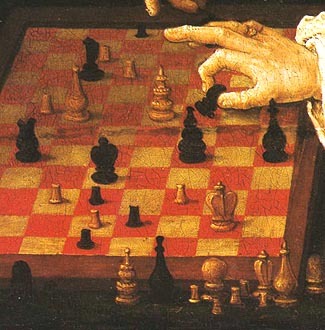 Courier chess flourished for over six centuries in central Europe. 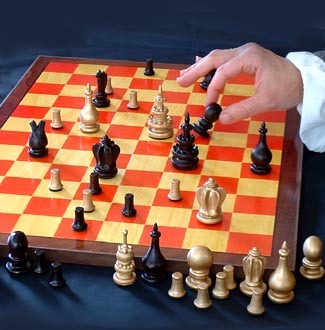 Played on an expanded 8 by 12 board, and with three novel pieces and four additional pawns on each side, the “courier game” was played alongside the old medieval chess and the modern chess we play today. 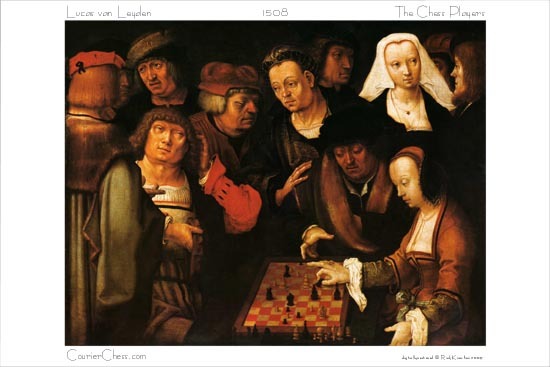 In 1508, the Dutch painter Lucas van Leyden captured the drama of courier chess in his famous painting, known as “The Chess Match,” “The Chess Players,” or “The Chess Game”. Now, after 500 years, the game in van Leyden’s picture has been analyzed and a faithful reproduction of the chess pieces and board have been created. Along with rules, first published in 1616 by the chess chronologist Gustav Selenus, the great game of Old Europe has been resurrected, and is ready to be played on into the 21st century! In March, 2009, an article appeared in The Chess Collector — the official magazine of Chess Collector International, discussing courier chess in detail, and referring to this new re-creation. You can download the full illustrated article (in PDF form) by clicking this link. I already purchased one of your sets and I love it! making this extinct game available again. The complete set of 48 pieces stand between ¾ inch and 2 ¼ inches tall (1.8 ~ 6 cm), the same size of those depicted in van Leyden’s painting. Hand crafted in Riverside, California, made of solid resin, steel reinforced where needed and hand detailed to recreate the 500-year-old painting as closely as possible. They are felted for comfort in play, and protection of the board. This copyrighted reproduction is available only through CourierChess.com, selling as rickofricks on eBay. 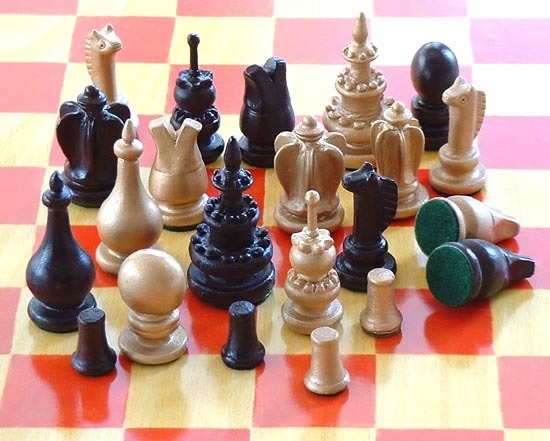 Since the first production of in 2008, additional versions of the chessmen and board have been created. See the link below for currently available sets. The board measures 19 ¾ by 13 ¾ inches; ½ inch thick (35 by 50 by 1.25 cm), just like the one depicted in van Leyden’s painting. The playing surface is a photographic image of a fine hand-painted German beech wood replica – likely materials for van Leyden’s original subject. It is reproduced here fixed to sturdy fiberwood board (MDF). A quality print, the same size as the original painting, is included (details below). Further productions are being developed. Check our listings for fine brass sets and hand made boards. The illustrated rule booklet clearly lays out the original rules of play with diagrams, pictures and explanations. To see this and further Courier Chess listings, select the link below. 10.6 x 13.8 inches (27 x 35 cm). Including the border, this print measures 12 x 18 inches (30.5 x 45.7 cm). Restored: Scrapes and damages have been carefully removed, restoring this painting to its original beauty. Fine quality: The image is finely detailed, printed with a glossy finish on a firm 10 point paper (about the thickness of a standard card stock).